As you can tell by my title, I’m not a nurse. I would never consider writing an article about what it’s like to be a nurse. As a chaplain that works closely with nurses, however, I see their dedication and skills and sometimes wish I could be more like them. They get tired, but are tireless. They are human but never lose their humanity. Their healing touch is worth more than a thousand words. 12. I will not be judgmental so, please, be totally honest about your physical and psycho/social history. I am not here to judge you. I was taught that if I point a finger at anyone, three more are pointing right back at me. Withholding important information could affect your care. 11. I care how your whole person is doing. Ultimately, I want you physically well. I also know that a healthy mind and spirit can help you get there. So, really, tell me how you are doing… all of you. 10. I don’t mind doing things that you might think are gross or mundane. I am well prepared to handle any product your body might decide to produce, naturally or unnaturally. Remember, I knew what I was getting into and I know you are more than your parts… and fluids. 9. Yes, nurses are male, too. Though it is true most nurses are female, the nursing profession is attracting more men than ever. 8. Go ahead, ask questions. No, really. I know that most people process their experience with illness by asking questions. Not only is it your right to be informed, but I want you to know everything that the health care team is doing and why. 7. You are very important to me — as important as my other patients. When I was in nursing school, I never imagined I would be this busy. I love all my patients and desire all of them to get well. Of course, this also means I often feel pulled in many directions. You, however, have the right to receive a response to your need in a timely manner. 6. Every day we touch someone’s life and everyday someone touches our life. More than not, I leave work feeling like I’ve made a difference. Thank you for allowing me the privilege to care for you. Your resilience and ability to think about others when you are the patient is inspiring. 5. We think about and pray for you when we go home. It’s so true. I can’t stop thinking about you. You’re almost like family. 4. We will always walk beside you. 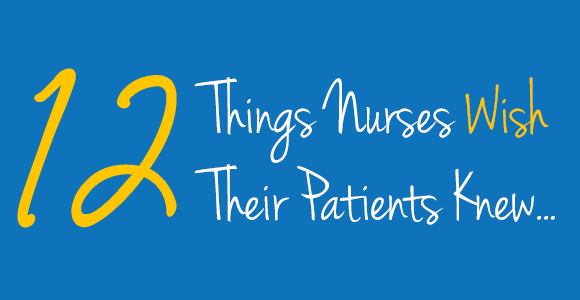 If you desire a positive experience in a hospital, you need a well-trained caring nurse. From your admission to your discharge I will advocate for you, be your biggest cheerleader, and assure you have the best experience possible. 3. A victory for you is a victory for us. You and I… we are a team. It takes great effort from both of us for you to get well. OK, you may not believe this one but you are indeed like a second family. Perhaps it’s your length of stay, the level of care you need, or your kindness that you express even from a hospital bed, but I desire for you what I would desire for my own kin—health and happiness. 1. We care more than you think we do. I may be flustered. I may be in a hurry. I always care. I encounter much that can knock me off my game to where I lose sight of how I appear to you. Rest assured, I care. I care so much I come in on days off and stay late and then come back the next day to do it all over again. I love my profession even with all its difficulties. You make my job worth it.